If a European company has made the decision to open up operations in the US and believes that going forward its main market will be in the US it can be tempting to dive into hiring US employees — including developers. In this article, we are going to explore some of the options for hiring technical talent to the US as well considering a number of common pitfalls and risks. We have undertaken research into the subject and have had conversations with a number of companies who have in some way made the move to the US or have considered moving technical talent and this blog shares these insights. Whilst we hope that you will find these insights useful, it should be noted that there are no hard and fast rules and that there will always be exceptions. There is a large delta in the cost of hiring technical talent between Europe and the US. Within the US itself there can be significant differences between the major start up hubs such as New York, Boston and San Francisco and less established tech hubs such as Denver, Austin and Minneapolis. 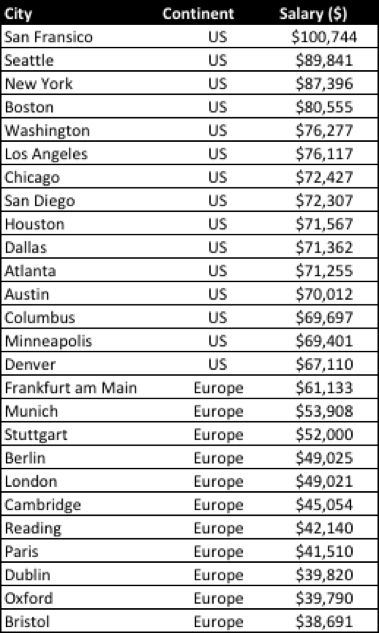 The table below shows median developer pay in a selection of cities in the US and Europe. The total cost may be higher because this only shows gross salaries and not additional benefits. As can be seen, the median cost of hiring in the US is considerably more than in Europe by almost a factor of two. As such, before moving to a top tier US city it should be carefully considered if a company can bear the additional cost — or looking at it another way, if the company could better utilise two engineers in Europe versus one in the US. Compared to Europe, companies will often find themselves faced with the problem that US technical talent is less sticky and harder to retain than in Europe. This is a result of how hiring can be seen as more transactional in nature with a good candidate likely to be seeking the best package rather than seeking to find a company whose vision they buy into — likely with lower pay. Whilst there will always be exceptions to this — and it should be noted that this is more prevalent in the major hubs such as New York and San Francisco where there is intense competition for talent — companies should be wary of the additional recruitment costs that are associated with higher employee churn. To retain the best talent European companies should be prepared to more equity that they may otherwise be used to in Europe. If you are an early stage European company attempting to hire technical talent in the US without a brand name to back you up and lacking a network in the US, it is likely that it will be hard to hire your first technical employees in the US — making building up a substantial team almost impossible. Lacking the brand recognition and concrete commercial traction in the US that will drive talent acquisition, it is likely that a company will have to pay up to hire the best talent — and even then, there is no guarantee that the best talent will be retained. The value of a European technical network should not be underestimated because founders will often be starting from scratch in moving to the US. This could severely limit the growth potential of a US based technical team until the company has built up a credible brand. If a company has a strong European technical network from which to draw talent and nothing in the US, the opportunity cost of moving technical team to the US may be very high. The location of the team can have a large effect on the cost of hiring the team as well as the ability for a company to be able to attract and hire quality talent. If a company is positioned in a highly competitive market such as New York or San Francisco then it is going to cost considerably more to hire an engineer than in other US cities. One factor that is often overlooked is that the CEO and sales staff will often move over to the US and start hiring non-technical staff in a city where it is extremely expensive to hire engineers — such as San Francisco or New York. In this situation, once the company grows to a point where it is ready to start hiring technical talent in the US, the location where they will be hired is in effect pre-selected and crystallised by the earlier decision to move the CEO and grow the non-technical team out of a given location. This runs the risk of greatly complicating technical hiring at a later date. As such, when a CEO is looking to launch in the US, they should consider not just the best location to start off, but also the implication of this location down the line when the company has grown a magnitude in size. Additionally, certain industry sectors can often define given metro areas in the US, for instance Detroit for autos, New York for finance and media, Washington DC for government and defence, Boston for healthcare and Kansas City for telecoms. As such, if a company seeks specialised talent or proximity to a certain class of client, it may be best to locate in a hub that has grown around that given industry. If it is decided to build a tech team on the ground in the US it is important that the team is seeded from an existing team. It is not a wise move to hire the team without a base of employees from which to grow — from both an ease of on-boarding and cultural point of view. To seed the team, senior technical talent should be moved from the home base to the US. Without starting with a base from which to grow companies will likely find it hard to attract the best talent — who are unlikely to want to be the first developer in the US — and will find building out a consistent team culture challenging. If a technical team is split, it should be considered how roles are specialised and how these roles are distributed across the team. One insight that came from our discussions was how, when working with a team split across multiple geographies, a CTO should ensure that the team is deliberately split into very specific areas of expertise that are working on separate elements of a product that can be run independently and mutually exclusively of one another. This way, whilst you must still ensure communications channels are established across the team, teams can operate reasonably autonomously of each other without needing the degree of communications that would be necessary if they are working on the same feature concurrently. In addition to splitting the roles strategically, a CTO should also pay close attention to the processes that are implemented to facilitate communications. If a development team is located away from a central location it is extremely important to keep communications channels open and it is the job of the CTO to ensure that proper processes are in place to make sure this happens. As an example, from our conversations a common approach was to dedicate a number of hours every day — potentially one to two — to team and sub-team meetings. This would not only be between technical teams but also between technical teams and product teams. The product teams requests are not implemented properly which will ultimately effect the ability of a product to achieve product-market fit. If a product needs to meet certain regulatory requirements and the technical staff cannot be in the same room to hear potential clients stress the importance of such compliance, the product team needs to go out of their way and take additional steps to ensure full buy-in and understanding from all parties to ensure such features are prioritised. As such, before any hires are made in a new location, a fully-fledged plan for developing processes for keeping communications open should be drawn up by the CTO and respective teams. The above factors should be considered when decided which one of the four options for moving technical talent to the US is most appropriate. In the second part of this series we explore the respective pros and cons of each of them.